I didn't expect Cupcake Vineyards' head winemaker to start talking about typicity. But that's why America has embraced Cupcake: there's more to this wine brand than you'd think, given the name. In fact, Cupcake represents an entirely new model of wine that others are scrambling to duplicate. The idea is that its fans will drink different wines from all over the world -- Central Coast Chardonnay Marlborough Sauvignon Blanc, Mosel Riesling -- and they'll all be Cupcake. They'll also all be $13.99 in theory (the industry term is "line priced"), though you can usually find them under $10. There are plenty of wine brands that offer a lineup of different varieties, but I can't think of any that want to make so many wines of typicity. "A lot of millenials like the Cupcake style," says head of winemaking Adam Richardson. "People become comfortable with the Cupcake wines throughout the line, once they trust the brand and learn the philosophy. Having a brand like Cupcake is a new development in wine marketing: having one brand where you can travel the world." However, Richardson has to balance regionality with the brand's expected taste profile. 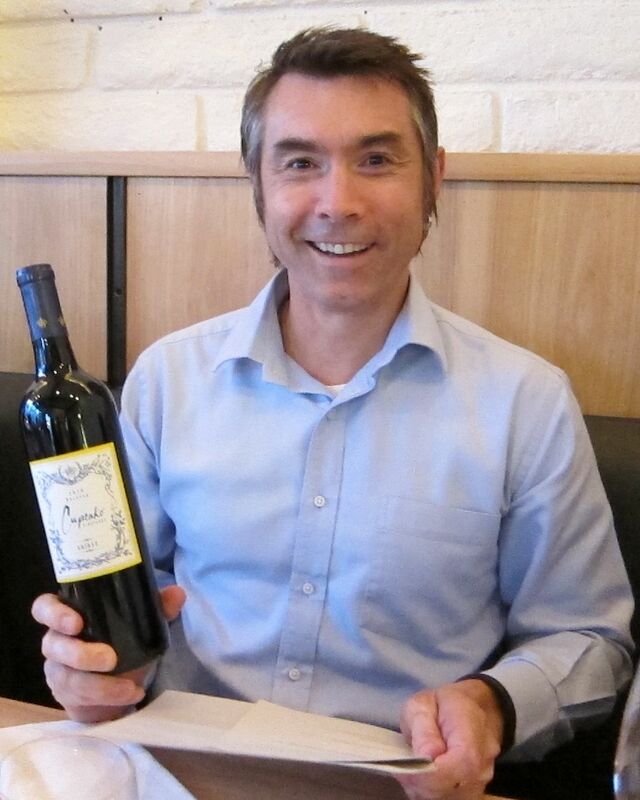 Richardson, a native of Perth, Australia, has put 14 years of study into the American palate. "In some ways, it's an advantage to observe it from outside," Richardson says. "(Americans) would like a wine to be more generous than a European would. They want something that's a bit easier to access, a bit easier to understand. Generosity is most important. In Europe, people are less worried about the actual flavor. The wine is more about the structure." It's interesting which wines Richardson thinks are difficult for Americans to love. "Bordeaux is popular in the US market but at the top end, the flavor profile may not be fully appropriate for the US market," Richardson says. Cupcake just introduced a Chianti. "It's not an easy wine to make a Cupcake wine out of," Richardson says. "In a lot of respects, the Chianti style is at odds with the Cupcake style. But there's been a lot of demand for it. So why not?" What I expected from Cupcake wines was something befitting the name: rich, buttery, sweet. That's not a fair definition of any of their wines, not even the openly sweet white wine called Angel Food. "We really try to stay away from buttery because it's the enemy of drinkability," Richardson says. I wouldn't drink Angel Food, but it's not bad for what it is -- tastes like vanilla with some key lime pie filling -- and you can't complain about false advertising. What I did like are the two best-selling wines in the Cupcake line: Chardonnay and Sauvignon Blanc. They couldn't be more different, yet they're both very solid. Cupcake Central Coast Chardonnay 2010 is earthy, with medium body, lemon fruit, decent balance and no overt sweetness, though there is a touch of RS. It's surprisingly interesting, and that's not something you can say about a lot of Chardonnays in that price range. Cupcake Marlborough Sauvignon Blanc 2011 is a little sweeter than the average SB, but it has good freshness and a moderate level of herbaceousness. I prefer the Chard, but this is a nice change of pace. I didn't expect to like the Cupcake Chianti 2010, but it has some of the best qualities of Chianti -- slightly sharp but juicy cherry fruit, some earthiness, a mouthfeel that seems to cleanse the bottom of the palate -- without the flaws that sometimes plague Chiantis in this price range. It tastes a little riper than the average Chianti, but at labeled 12% alcohol, it's not fair to call it New World. And it's better than the mass market Chiantis the Italians have been trying to sell us for generations. The Cupcake Moscato d'Asti 2010 is also a respectable effort; a lot of wineries are doing a lot worse in the rush to get Moscato on the shelves. It's simple, fairly sweet, and has a bit of that Moscato prettiness. Where Cupcake lost me was with the Cupcake Mosel Valley Riesling 2011; the Blue Nun-esque bottle should have been a hint. It has no acidity, complexity or minerality, but does have more than 25 grams of residual sugar, and is more like flat soda pop than wine. I told Richardson this, and he said, "This is my favorite wine in the lineup. It does everything that a Riesling could do. It's the most versatile, the most food-friendly, and the least intense in terms of putting its personality into the wine. I'm very confident in where this is. It's pure. It's clean. The sugar doesn't mask it." Granted, he sells thousands of cases of Riesling and I don't. The most surprising wine is the Cupcake Barossa Shiraz 2010, which is dark, oaky and a little savory: not at all the fruit bomb I was expecting. "I'm looking at turning the full-on Barossa style back, so it's drinkable," Richardson says. Surprising for Cupcake to take what, in today's wine world, amounts to a philosophical stand, but maybe not so surprising that it happens closest to Richardson's home turf. The Wine Group is confident enough in the power of the Cupcake brand that it has extended the line into vodka, with elementary school bake sale flavors that to me, diminish the maturity of the brand name. I haven't tried them: maybe Devil's Food, Lemon Chiffon, Frosting, Ginger Snap and Very Berry vodka are delicious; maybe all vodka should taste like breakfast cereal with a prize inside. "We thought, Cupcake is a very strong brand," Richardson says. "Cupcake lends itself to a flavored spirit." The thing is, the Cupcake vodkas make sense of the brand name -- I'd rather eat a devil's food cupcake than drink one. But the wines, with the possible exceptions of the Moscato and the Riesling, do not. So where did the name come from? It was all about American culture, Richardson says. Americans just like cupcakes. We really are as simple as that. There is not much new about his business model. Origen. Cam Hughes. Cakewalk, I mean Layer Cake. Just to name a few recent. But maybe Cubby Cake, I mean Cupcake is a better looking name & label. Wait a few years to see. Yeah, I don't really think the business model is that new, either. But I do think the brand name is a winner. Americans do love cupcakes. It's cute. The label looks sophisticated enough that the wine doesn't seem cheap. It's got a great price point. It's totally accessible. However, I honestly don't know if most consumers even notice that the wines are from different regions. If they do, I don't think they choose Cupcake because they think it'll be a good representation of that region. They choose it because it's cute, accessible and priced right. The business model is very different from Cameron Hughes, who is a negociant basically buying finished wines. Cupcake is having them made. What's unusual is how widespread their reach is. I don't know of another company making wine under the same label in Italy, Australia, Germany and the US. I don't really know Origen or Layer Cake. But they're not huge like Cupcake which has become one of the biggest brands in the US in just a few years. So that's also something. Layer cake has 3 or 4 big reds and a Chard. It seems to me that Cupcake has a more diverse portfolio, it's probably a much bigger company. Im curious to try it. I tried few of their wines, but seriously, they are not much better than 2 Buck Chuck, and have similar successes. Blake, really, at price points of $8 to $12, you really think the wines are made to order? Or the boss goes over there and makes some decisions on what, when or how to harvest, what yeast, etc??? Really? With billions of gallons of wine still sloshing around? You don't know Origen? Layer Cake? How about unsuccessful Sauvignon Republic? Geesshhh. What are you, Rip Van Blakle? I guess it wouldn't be the Internet without some good old fashioned rude know-it-all. You might try googling my name and Sauvignon Republic. I would like to google a list of negociant brands that have come and gone Gone. Nobody cares. If you write that Cupcake is an important pioneer, how about doing a little due diligence of your own? The last time something IMPORTANT happened below $12 was when Mondavi sold their status down the hole with Woodbridge. Or maybe when Glen Ellen put their first foreign sourced bottle on the shelves and a few years later, Gallo sold 12 billion cases of Vin d Pay Pinot noir. Cupcake is a success in the market, like Yellow Tail, but not a pioneer. Write more accurately and you won't be rude-ded. How long did Sauv. Repub. last? Was it an important milestone? Man: If nobody cares, why are you still here? Layer Cake is ubiquitous in my area (Minnesota). It was started by Jayson Woodbridge and Chris Ramonski of Hundred Acre fame. They make a Central Coast Chardonnay, a California Cabernet, a South Australian Shiraz, an Argentine Malbec, and a Italian (Puglia) Primitivo. The Shiraz has been very successful in my market. I think Layer was probably first with this idea. In fact, back a couple years ago, the folks at Layer Cake filed suit against Cup Cake owner, the Wine Group, for stealing its business model. See here: http://www.winesandvines.com/template.cfm?section=news&content=63367&htitle=Who'll%20Take%20the%20Cake%3F. From my view, working the floor in a wine shop, Cup Cake’s success has little to do with its typicity objective. In my market it is purchased almost exclusively by women. They like the name and the packaging is very eye-catching and memorable. In addition, they seem to be able to source pretty decent fruit and vinify it with broadly appealing results. I’ve never heard any consumer make any reference to its place of origin. Most don’t seem to pay any attention. At one time, Cup Cake made both a Mosel and a Washington State Riesling. To consumers, they seemed to be interchangeable, even though we stocked each in a different area of the store. Kent: I should have guessed that women buy Cupcake wines. Personally I think cupcakes -- the real thing -- are the most overrated food trend of the millennium. Seriously. Every food mag/newspaper goes nuts for them, but they're not really that good. But then, I'm a guy. Had the Shiraz last night. Wow, a real steal for the $8 I paid, and not at all what I expected based on the back label description! Overall, every Cupcake I have tried has been pretty typical of it's region and good value.